Although not strictly a Casio Pro Trek watch, (this is in fact classed as Casio Leisure), we list this in the Pro Trek department as it contains many Pro Trek features, at a budget price! This model looks like a mini Pro Trek, and features 200 metre water resistance, thermometer, direction sensor and temperature sensor. Great watch for the price slightly smaller than expected useful for work. Good work watch not as big as I was expecting nice strap it is quite small, would be a good watch for a for a younger people. Great looking action-man watch with all the features I require time, day-date, alarm, stopwatch plus it has a compass! Built to last the passage of time. Excellent value watch, slightly complicated to set but ok once got the hang of it! I really like this watch, its compass is accurate and a great feature. It is robust and able to take tough use, and physically activity such as contact sports without being a danger to the wearer or other players due to its tough non metallic exterior. The thermometer is ok, but not very accurate and acts more like an indicator. The strap and clasp are good and can take rough use as well as the watch itself. Great watch for the money, compass worked better than I expected. The Casio Protrek name tells you just who this watch it is aimed at. If you are the kind of person who travels around the world through different time-zones and in all temperatures, with a hectic schedule, needing regular reminders, occasionally plunging into the deep or going off-piste and needing some sort of guide to point you in the right direction, then the SGW-100-1VEF was probably designed for you.\r\nBut sadly - like many - I dont have such an exciting life. I generally find myself in only one time zone, knowiing exactly where I am, where the temperature varies little, often kicking my heels for something to do and only very occasionally even paddling in the sea.\r\nBut after several hours research I still decided this watch was just for me. First of all I wanted something lighter in weight - and with its resin case and stainless steel back, this only comes in at around 55g - one third of the weight of my previous timepiece. Secondly I wanted multiple alarms - at least four - and there is still a large group of us users who want multiple reminders fixed securely to their wrist - even though few sellers and even some manufacturers bother to say how many alarms are included. \r\nThis timepiece has five alarms - thats five daily alarms - with the added advantage of an hourly time signal. And one of the alarms also has a snooze function just in case. If its too dark to see the display, a click of a button brings into action the electro-luminescent panel which causes the entire face to glow for brief but easy reading.\r\nBut what about the distinctive compass feature, I can hear you ask? Yep - thats certainly an advantage if you get lost in a big city or spend time wondering around the countryside. Ive not had time to try this out yet in anything but the most rudimentary way, but it seems to work even indoors on the face of it. Take care though not to put your watch near loudspeakers, a TV set or any other source of magnetism, as that can skew its accuracy. But even then theres good news because, like the temperature, there are full instructions about how to re-calibrate it.\r\nAs you might expect from many digital watches, this one includes an automatic calendar, world-time, 12/24 hour modes, stopwatch and countdown functions. It is designed to be water-resistant to 20 bar around 200 metres and the manufacturers claim its also resistant to temperatures as low as -10 degrees C, and comes complete with a battery which should give you about three years uninterrupted use. Time will tell.\r\nIve only been wearing the watch for a week, but so far the only concern I have is that the strap isnt quite long enough for the largest of wrists mine is quite large and being made from resin, perspiration does tend to gather behind it - but thats a problem with the strap and not the watch. The mineral glass face is said to resist scratching, though I couldnt find any reference to a crystal coating like some more premium options. But it is recessed inside the compass bezel, so a glancing blow would have to be focused to cause problems. The arrangement and use of the buttons is quite intuitive compared to some other watches, and the buttons themselves are a good size, which makes operation easier for those of us with large fingers. Button tones can be switched on and off to suit the user and the location where the watch is being used.\r\nIf this timepiece lasts as well as it looks and it works, at a price like this it will probably be one of the best investments Ive made. My rating would have been excellent had it not been for the strap. Bought this product for my boyfriend. It looks great and the compass and thermometer are so useful for hiking trips! Good watch at a good price. Even before I cashed in my bonus points. An excellent watch for low price. Not quite a true pro trek, but just as good. Very happy with the watch and the service. It does look a little basic on the wrist, but does everything it claims to do. My only disappointment is the thermometer. As I am not a diver and am only interested in the local ambient air temperature, the watch needs to be removed from my wrist for about 10 minutes to obtain an accurate readout and avoid a false high temperature reading, caused by body heat. The Casio Pro Trek wrist watch was delivered to store in good time to be picked up at a convenient time. Online and in store experience exceeded expectations, with the Watch Shop having a large range of choice to suit a range of uses and styles, and the Goldsmiths Jewelers offering excellent customer service in addition to displaying their own range wrist wear and jewellery. Needed a cheap protrek watch but couldnt afford the real deal. This is just as good and has the dual sensor with the compass which I needed. Brilliant buy and would recommend to anyone. An excellent watch. This was a present for my husband to replace his old Casio watch. He was very impressed with the features and especially the feature where the screen lights up. The compass and thermometer are useful features and he has enjoyed playing with these new features. He would have preferred a metal strap but is more than happy with the overall look and feel of the watch. Casio pro-Trek SGW-100-1VEF watch ----------- Another great value casio watch which is going to FINLAND with me skiing in march 2016, Temperature senser in the watch will be very handy along with the compass -------- My fourth CASIO ----- all still running perfectly . Husband very pleased with this purchase. ALL features work well, including the compass, now I know he wont get lost whilst wearing it !!! My brother loved this gift from me. Really comfortable strap. Not stiff at all. The big dials are the best feature. No issues with compass calibration and looked at the thermometer after being off my wrist overnight and it was spot on. The watch has a very clear display which I can read easily with or without my reading glasses. the compass and temperature sensors seem to be very acurate. Sorry, cannot give much of a review other than watch is fit for the purpose it was bought for. Watch is light and easy to use. Was attrached by the thermometer function, but I am not sure it works as well as it could do. When I know it is -1 the watch still thinks it is nearly 20degrees! I wish. Other than that it is great and just what I needed. Was looking for a work/leisure watch as a gift for my husband,was torn between this design and g shock watch after having heard how good g shock is for durability however was very pleased with purchase the compass and thermometer are great features and easy to use.The look of the watch is better than the photo and does not look cheaper than a g shock watch,needless to say my husband is pleased it,very good quality at reasonable price. Excellent service, value and quality of product. Bought as gift and very well received. Great watch, bought as an early Christmas present for my dad. He absolutely loves it, very sturdy and durable with lots of great features! Amazing for the price. I was looking for a watch to wear while out on my bike and walking/running. The display is clear and well laid out. operation of features are easy to access and setup. The watch strap is sturdy. if you are using the temperature feature you are best taking the watch of your wrist for a few seconds before taking a reading, this is a minor irratation as dont use the feature much. Product as expected. Not as robust as my previous ProTrek, but looks like it will do the job. Instruction manual like Lord of the Rings.... Once sorted its brilliant. Got it to help navigate when I go kayaking. Love it. I looked around for months to find a watch which is best bang for the buck, that means maximum for a little amount of money. I spent several nights comparing different watches from several producers. As I had low budget, I couldnt afford some very high-class watches. At the same time I didnt want something ordinary, what everyone own just a gadget what shows time. I wanted something with as lot of useful features as possible. As a result, I found SGW-100-1VEF. It liked me because it had a low price and at the same time a lot of functions - world clock, stopwatch, timer, alarms, light illuminator, compass and thermometer. In addition it is 200m waterproof. I think it would be hard to find something better for that price. For now I have been using that watch about two months already. Best pros about this watch: solid black color usable also in ceremonial events, light visible at night, calendar, stopwatch best for trainings, intervals, timer, alarm no need for additional alarm clock. Last but not least - it is 200m waterproof! Cons: thermometer respond time is slow to get accurate temperature you need to stay about half an hour in the same environment, compass requires horizontal surface better to remove watch from wrist. Although it is waterproof, it isnt shockproof need to watch for more expensive Casio G-Shock models. Even though there is slow respond time for compass & thermometer, I still recommend this watch. Previously I looked time and used for other functions timer, stopwatch my phone. Now, as I own this watch, I dont go nowhere without it. My husbands watch broke down and I found luckily this very functional watch with very good features. Not only the compass function is good, also the temperature function is very handy for outdoor people like us. This watch is excellent value for money. My partner uses it to go to the gym,swimming and walking as it has a compass on which he loves. I bought this watch for open water swimming and it has been AWESOME. I was a bit wary that the temperature might not be accurate, and its air temp is not great: if left off for 15 minutes or so it will accurately read air temperature, but if youre wearing it then the heat of your wrist inflates the temp. However, it works PERFECTLY in water, as the water is not affected by body temperature. The .10 degree is really useful for proving youre not hallucinating those cold patches, and I know the compass is going to save my a some day when its foggy. Ive swum with it once in the pool and twice in the sea, and the stopwatch and timer functions are invaluable. Its a little fiddly to use in a pool session, as you have to click through a few functions to reset the time on a countdown, but in open water its ideal. The watch face is easy to read, and the whole thing is quick to set up and easy to navigate once you know what youre doing. As a rather short woman, I worried that the watch would be really bulky and heavy, but its not - I hardly notice Im wearing it. I did a huge amount of research before settling on this watch, and its exactly what I wanted. The only things that would make it better are a GPS system and a heart rate function, but that would significantly drive up the very reasonable price. For my type of swimming, Im much more interested in knowing how long I was in and what the temperature was, so those functions arent as necessary for me. Relly nice watch excellent price and quality.The thermometer is perfect for the use.Backlight ,as it illuminates only the digits.A very good outdoor wath. Watch seems robust and does everything I want of it - have not yet checked out all the features. I hope it lasts longer than others I have bought. Very good looking and practical watch with a few gadgets to play with. Great watch for the money. Watch seems good. Have not checked all features yet - but seems to be good for the price. it is am excellent item wit excellent condition, I bought this as a gift. Too small for my wrist but great looking, compass works well but temperature seems to be a bit dodgy - says 39 degrees I wish when it is actually just 16 degrees. Still a great looking watch but would go for analog next time. Very happy with watch, excellent value. Was looking for a cheap outdoor watch for hiking and climbing that was reasonably robust. This watch does the job. This watch is robust yet light. The face is clearly visible whether Im trekking and using the compass or under water timing my air supply. It is the best utility watch I have ever owned. It was excellent service , very fast delivery. Certainly still be using your service and have recommended it to friends. A nice low cost watch with the quality you expect from Casio. The watch contains the normal features you expect from a digital watch. Alarms, stopwatch, Timer, world time but has the added features of a thermometer and digital compass. As you would expect to get a correct temp reading youd best remove it from your wrist for a few moments. I found I had also to calibrate it so the correct temp is shown I happened to have a baby thermometer for my little one so use that as a reference. The digital compass also had to be calibrated even though the instructions said it should be ok out of the box, the watch kept flashing up calibrate. Its an easy process of turning the watch about on a flat surface in accordance to what it says on the watch face. The case of the watch seems quite robust and the weight is not too bad, coupled with a half decent strap making it feel secure on my wrist. Overall I am very pleased with my purchase of this watch and I would recommend it to others. This is a very stylish and functional watch. Easy to use and has great features such as a compass and temperature sensor. These combined with the multi-timezone modes and 200m water resistance make this an excellent choice! Really nice watch, working well. Delivered very fast. Excellent service! I recommend the shop for everyone! You can find all the information you need from the product, pictures, specification. Im gonna choose them again. Great watch, ideal for wok and leisure, not as robust as a G_Shock however its a fraction of the price of a G. All round a great watch and as usual great service from the WatchShop. Having liked the features of this model I bought it and am quiet satisfied. There is a difference in the temperature readings between this and the casio duro 200 by 2 degrees Celsius. More thought should have gone into the strap as it feels like plastic and cheap.The only other thing that you may not like is that when you have the world time display on you cannot see the current date at the same time.Not something that I get with the Casio Duro 200. The functions are easy and the same as any other Casio watch.If I had to design this beauty I would have taken out the unnecessary outer ring beneath the bezel so that the display could seem a little larger.Not sure if they could have packed a rotating bezel since it is water resistant to 200M. Great watch, really easy to use and looks very cool, even a bit mission impossibly!! Pros: Lightweight, appears to be a strong case, world time for when travelling, easy to use alarm, countdown timer and stopwatch. I shall be using the stopwatch and compass for diving. Unlike some other people who have reviewed this watch, I had no problems with the instructions, apart from the very small type and the compass is easy to calibrate. Come on people, read the instructions, it isnt rocket science. Cons: Have not found any. Pros- Large display, easy to read. Good back light. Usefull stopwatch & timer. Good looking watch, very able to cop with outside work & lip round face protects the watch glass. Cons- it keeps asking me to calibrate the temp/digital compass, after reading the directions, I still have no idea how to do this, luckely this is a useless funtion to me. All in all, a good value watch for outdoor work as long as you dont want the terperature or compass bearings. Cant fault Watchshop ! I wanted a relatively inexpensive watch to wear when swimming, on holiday, snorkeling, cycling, and generally doing stuff around the house when I would not want to be wearing a finer watch. I chosed this one because it had 20ATM depth resistance, the price, and it had a few extra features I thought I might like. I looked at ones with barometer / altimeter features but they all seemed to get poor reviews. The compass works reasonably well, yes you have to calibrate it once every 100 days, but that is no great shakes, and the thermoter works well - although I havent checked it against an accurate thermometer. Overall the watch is very comfortable, the strap is fine, and the watch is light. As for looks - it is OK, sure it is not an elegant thing but my wife reckoned it was better than she was expecting so thats fine. This was bought as a easter present for my husband, as he was always going on about them and i thought what a great time to buy.We received it quickly, and the watch itself was better than expected. My husband be happier, good quality, great opportunities, it is easy to carry, value for money. - Seems durable, height of the surrounding ring seems adequate to protect from most accidental scratches. - Large time display, world clock, many alarms, stopwatch and countdown timer, I dont think theres anything missing time-wise. - The thermometer is perfect for the use I wanted it (underwater), and it can be calibrated ! - I love the backlight, as it illuminates only the digits which make them extremely readable. - The compass calibration process seems tricky but is rather simple. Just turn around 2 times aaaaand press a button! RTFM and youll be fine! - The thermometer is inaccurate when wearing, you have to take it out and let it rest for a while before it takes correct readings. I dont think theres anything else..
All in all I love it! Purchased for use in open water swimming,, and so far it has met all expectaions. the stap is comfottable, the watch not too bulky and it was easy to set up and use. Good product. Does what it says on the item description. I initially thought it would be difficult to set up but it was quite easy. The delivery was on time and efficient. A very good outdoor watch. Hello! i bought this watch for its characteristics and i received just what i was expecting: great watch with good response, suitable for trips in the nature. watch is good. The manual was too big.. but overall the watch is good and I am happy with the purchase. The temperature and direction functionality works well. Good size watch. Comfortable and secure strap. I needed to refer to the manual to help set it up, but it was clear and concise and easy to follow. Data is clearly displayed on the screen even in strong sunlight. delivery exellent. I have not checked how good watch is but seting up all functions is tough. Manual is very simple and not very helpful. Defenetely I advise to buy watch through WatchShop. Great watch with numerous features, although a little complex to calibrate the compass. My only critiscism is the stop watch which only seems to count up to 1 hour and then reverts back to zero hours (unless someone can show me what I am doing wrong). Lightweights and comfortable for sports use. The first thing is to say how pleased I was to receive the watch which arrived within five days of making the order. There is no doubt that it is a close run thing to the more expensive model that you offer, which makes me feel rather smug that I didn't have to pay as much as some other people have for the ''more involved'' model. What I received is more than enough watch for the sporty type. Thank you. I like the compass , and the low price! Couldn't find anything better at twice the price . Lovely watch! Much smaller than I expected. Fits well on my female arm. Easy to operate, looks and feels durable. Casio says the battery should last 3 years (alarm operation 10 sec/day; illumination operation 1.5 sec/day; direction reading operation 20 sec/day, temperature reading operation 20 sec/day) and the watch has various time zones to choose from (for programming dual time). Compass is very comfortable and accurate, easy to use. Instruction book explanes all features and functions clearly, most programming is very simmilar to other watches, so no problems with setting up. Did not have any problem with length of light. Short but enough to see what you need to see. Saves battery power. Although Casio warns that frequent light using will run down the battery quicker. The only feature for a hiking watch I miss is the altimeter, but who would expect to get that for 46 squid? Overall, 5 stars, a real bargain for money! Would reccomend it to anyone who needs a sturdy watch for outdoors and every day use. Will test if it's caving proof today! Much smaller than I expected. Fits well on my female arm. Easy to operate, looks and feels durable. Casio says the battery should last 3 years (alarm operation 10 sec/day; illumination operation 1.5 sec/day; direction reading operation 20 sec/day, temperature reading operation 20 sec/day) and the watch has various time zones to choose from (for programming dual time). Compass is very comfortable and accurate, easy to use. Instruction book explanes all features and functions clearly, most programming is very simmilar to other watches, so no problems with setting up. Did not have any problem with length of light. Short but enough to see what you need to see. Saves battery power. Although Casio warns that frequent light using will run down the battery quicker. The only feature for a hiking watch I miss is the altimeter, but who would expect to get that for 46 squid? Overall, 5 stars, a real bargain for money! Would reccomend it to anyone who needs a sturdy watch for outdoors and every day use. Will test if it's caving proof today! Fantastic watch. Thinner than I was expecting which is nice, I have owned another pro trek watch which was really bulky. The display is really clear and easy to read and the backlight only really lights up the digits which is nice. My only complaint is that you can't swap the way the date is displayed over, so you are stuck with mm-dd. Nice watch! Eeasy to use and powerfull. Recomended for anybody. Love it! Thank you! Very pleased indeed with this my second Casio watch, and i find it does many ore things than I knew when I placed the order, such as world time in nearly 50countries, and temperature. Display is large and clear so I can read the time without having to put my reading glasses on. the watch came in good condition. That was what i had been looking for. 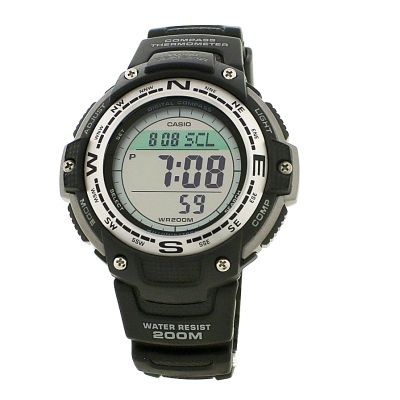 good designed and essential functions including water resist up to 200 meter and digital compass. will come back for another watch. my husband likes his watch. arrived on time, looks good quality. no complaints at all. If you are looking for a watch that matches Pro Trek or G-Shock high standards, this is not it. Week number in the main mode would be nice. The letters indicating cardinal directions are 99% of the time worthless, when you are using the watch every day. Thermometer is nice, but I rarely use it. Text on the strap and on the dial doesn't have to stand out that well. For a watch that potentially would be used every day, this looks too cheap. Overall feel of the watch is this: not very beatiful, not very useful for the daily use and not very thought through. It could be better with little changes, but it is what it is. For the current price it is a bargain. Design tries to be rugged, bulky and techo looking and succeeds moderately. Some of the components are too big and have sharp edges (especially near the letters W and E). Edges may sometimes grab onto some clothes. The letters N, E, S and W are squished vertically and horizontally to fit into space, and not drawn from scratch -- negative style points. Font use on this watch is appalling -- I counted at least 3 font families on the face itself. Shame on you, Casio! Even though the watch itself is duo tone -- black strap and gray components, they have added another extra color (light blue-teal-green) in the dial. I'd rather they didn't. Extra color adds unnecessary complexity and cheapens the overall look. This watch has a twin brother which uses the same dial (SGW-100B-3VEF) and has ridiculous coloring on the face and leather/fabric strap. Needless to say that the twin brother doesn't sale as good as this watch (out of stock again). Beware! Compass doesn't work inside buildings, vehicles or other metal structures (this is not a design flaw). Also don't try to use it near computers and other machines. Compass needs to be calibrated every 100 days or so in order it to be somewhat accurate. Watch manual prohibits using watch compass as a primary navigation aid. This watch is a great backup for the primary compass when hiking or doing other serious stuff. This watch is affordable enough so you wouldn't need to take special care of it when doing some hazardous activities, like getting into a bar fight. The dials starts loosing visibility near 30 degrees (0 degrees: looking directly into the dial; 90 degrees: dial not visible), this is my biggest complaint so far. Very rarely my hand is positioned in such a way that the viewing angle is near 0 degrees. I would like to turn my hand as little as possible to get a good reading. Light stays on for 1.5 seconds after pressing the button, which is too short a time. You cannot override this by pressing and holding the button, because after 1.5 seconds the light goes off. The light itself is bright enough and works great in dark. In a nutshell: this is NOT a watch to impress people -- you will gain zero or negative style points. This is a simple watch to be used for timekeeping in a casual environment (I would not go to a fancy dinner party with this watch). Ideal for wearing while fishing or playing football, while touristing in a city or while saving money to get the G-Shock with Tough Solar. everything went fine, no problem with the delivery, watch works and it is in perfect condition. I have bought this watch for a birthday present which I have not yet given, but am sure it will be well received as it has lots of features and is very stylish and value for money. Excellent watch is anyting that you can possible ask from a watch. It's very good when you go camping. My 15 year old son was delighted with this watch. He realy liked the compass feature and used it to navigate his way to school that morning!!! !I was worried it might appear too large for his arm but it looks great and he is liking showing it off to his mates. I have bought this Casio watch mostly for outdoor usage. So the plastic band and illuminator was a must in the watch. First I have checked the cheaper G-shock series, but later I have found this superb small brother of the real Pro Trek series. You know the funny thing is that you can purchase nearly for "nothing" a really really massive smart watch. Just imagine what can you buy for Ł46 nowadays? At Watchshop you can buy a Casio watch with integrated thermosensor and digital compass, and with the other standard futures. Honestly I can recommend for everyone this watch. It is really worth the price, and I beleive that I will find my way always with Casio watch :). A very good watch. I like it because it's smaller than others in his league and it's very smart. It can do a lot of things and fits the hand very well, and it's very easy to use. It has a good brightness and it's very useful. I recommend it without hesitation. Well I bought this watch as I needed a sports watch I could use whilst training rather than my metallic watch. I needed something cheap and reliable but as a typical man gadget-ness took over! The main selling point for me was the guarantee offered by casio as I will be putting this watch through it's passes in a few harsh environments! Now I haven't worn a plastic watch in years so at first it felt very light but two weeks in and it feels like a second skin. The buttons are nice and chunky so there easy to use and the markings are nice and clear to see. During the day the watch is great, giving you somthing to fiddle with during those boring meetings! The only thing I would say that the dates around the wrong way! Day then month please but hey that's just me. At night the watch is easy to use and the light clearly shows what you need to know however the light only stays on for one second which really means the other functions are defunct as you have to guess where they are or keep hitting that light button! One advantage is an easy beep on/off mode which is very handy for my needs. Over all this watch is fit for purpose and to be honest is dirt cheap for what you get. It's got a nice chuncky feel and the pros out weigh the cons. I would buy another one but would stick to basic functions, time, date, stop watch light and alarm. This watch is robust and easy to use. It is a bit 'taller' than I thought orignially but is probably due to the fact I had a slimline watch previously. It is comfortable to wear and a good read of the instruction manual should clear up any initial concerns about how to use. I have been using the watch for a number of days and am very pleased with it. It's attractive looking and comfortable to wear. The display is easy to see with the main time displayed in clear sizeable digits. The overall thickness of the watch body isn't a deep as some of this style are, which isn't a bad thing - you kind of get the style without the bulk!! The criticism I have is with the self cancelling aspect of the digital compass after a few seconds. I'd prefer to have the option of leaving the compass displayed - but hey you get what you pay for and overall I reckon this watch, and what I payed for it, equate to good value for money. Requiring a watch that would meet all my needs for day hiking, this watch has achieved this for little cost. The face is easy to read with large digits that are illuminated well at night. Within a short time all the features are easily learned and adjusted. The compass is a great feature which I am sure will come in very handy and getting a map bearing is simple. A couple of button presses and direction is found. The robust construction will hold up to anything the lakes will throw at it. Excellent watch. Does every thing I wanted it to do and more. Fraction of price of larger Pro Trek watches and not as big on the wrist which to me is a plus. The only thing it doesnt do that the Pro Treks do is the altitude which I have no use for anyway. Top class watch, great price and next day FREE delivery from a great company who I will use again for sure. Absolutely fabulous watch for the money, I heard a few comments about the watch needing to be off your wrist to read the temp accurately, this is true for every temp reading watches, even the Tissot T-Touches are not accurate when on your wrist, also I have had a £200 Protrek before and this one is as good for a fraction of the cost, nice LED light too. Excellent quality for the price. Gives many useful features, which are easily operated. For example Temperature. Compass, Various Worldwide City times. Style of watch is very robust looking. Easy read dial, with back light for night time display. This watch is really a great value for money. The compas feature is really reliable and useful. The only drawback of this watch is the thermometer that influenced by body temprature. However even the expensive watch (i have one) thermometer having this 'error'. Overall, Features offered by this watch is as good as offered by expensive watch! Ordered Sunday, got an email monday, watch arrived tuesday! Great service. - Not happy with the quality of the strap. Plastic is never good as metal. - Compass needs resetting quite often if watch isn't level. - Doesn't look high quality as i would have expected. I ordered this watch Tuesday Morning, and to my surprise it was delivered Wednesday Morning, that sort of service is very rare nowadays. the watch has solved our 18th Birthday Pressie in one swoop for our Grandson. Shame the Free Gift Bag I asked for did not materialise. This looked like the ideal standard watch for me. I already have a dress watch for more formal occasions. My new watch was for my normal day to day requirements - providing what I consider the essential functions: Time, Date, Alarm in an inexpensive package. I find analogue hands easier to read at a glance but a digital display is often useful too: this watch has both - and the LCD is in high visibility large numbers. I like to be able to tell the time in the dark too! so there's a back-light and I want to be woken so there are alarms! I was hesitant about Timex brand having had a bad experience - but that was 20 years ago and after an extensive internet search for a watch with the features I need this was the best match. It includes stopwatch and countdown timers - not on my must have feature list but nice to have and I do occasionally need them. Finally it's water resistant - I need that largely because I'm quite capable of forgetting I'm wearing a watch when I have a bath! - but also reassuring if I'm hill walking in the rain. Then it arrived (very promptly from an Amazon partner). There was no digital display. I read the instructions and pressed the right button to turn on digital display - nothing. I tried the backlight function - nothing. Shipping a dead-on-arrival watch confirmed my previous experience of Timex. It's been returned and I've asked for an alternative watch from the Casio range, similar specification, same price. My last watch was a Casio and only died recently after 12 years service. I did have another concern with the Timex - it looks as if the strap can't be replaced, that could mean that this watch will be rendered useless within 3 years judging by past experience of plastic straps. As an active hill-walker I was attracted to more advanced expedition watches at 3 or 4 times the price but on reflection decided that their additional functions were of no real benefit to me. An altimeter function might be useful when hill walking but being barometric it's going to be a lot less accurate than a GPS. Similarly a temperature sensor will be influenced by body temperature depending whether the watch is exposed or covered by sleeves/gloves. Watches with a compass function don't give direction sufficiently accurate for difficult navigation so I decided that all these options add to price without being good enough to replace a proper compass. Does what I need plus a bit! It's not scuba diver's watch but it's as waterproof I need (out in the rain, swimming etc). Large display so I don't need my reading glasses! Back-light so I can check the time in the dark. Useful set of alarms, stopwatch, countdown timer and full date display. With the number of functions available the instruction book is necessary but once read, it's all pretty obvious. And the Plus a bit - it has compass and temperature sensor. Temperature is only accurate if you leave the watch off for 30 mins, otherwise the reading is bound to be influenced by body heat/clothing. Compass calibration is best regarded as a game, I don't think it's possible to complete succesfully! Once calibrated it's accurate to plus or minus about 5 degrees, so if you're in the wilderness you'll still need a proper compass but otherwise: good enough. Overall it's comfortable, easy to use, looks good, provides the functions I need well and as a Casio I'm sure I can look forward to at least 10 years reliable operation.